Dying Daily: What Does Taking Up One’s Cross Look Like? 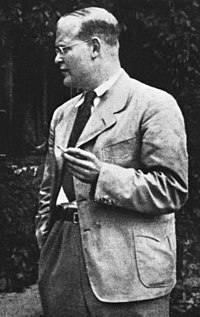 Dietrich Bonhoeffer did not have to help Jews escape Nazi Germany and flee to Switzerland. After all, he was safe and sound in New York in the early 1940’s. He was free to stay in America and preach the gospel from the safety of a free church pulpit or teach New Testament in the peace and freedom of a university. But the gospel he preached compelled him to return to Germany and stand against Nazi aggression. The Abwehr had been a failure, staffed by amateurs and used as a convenient cover by a number of members of the resistance, such as Dietrich Bonhoeffer and (Eberhard) Bethge, Hans Bernd Gisevius, Otto John and Josef Muller (173-174). The ministry rise of Brad Hoefs was meteoric, and his collapse was just as sudden. In one confusing episode, he went from successful pastor at one of the fastest growing churches in his denomination to a public disgrace. From family man to family embarrassment. He didn’t understand why, and neither did they. Growing up, Brad had watched his father deal with symptoms of manic-depression. His dad took medication, but the family wasn’t supposed to talk about it. Not understanding his family history, Brad, as an adult, spent months taking steroids prescribed by his doctor for a medical condition, not knowing that these steroids could have unfortunate side effects. Soon after, he began to have times of surging energy, creativity, and nonstop drive. It paid off. King of Kings Lutheran Church in Omaha, Nebraska, rode this wave right along with him, growing from 800 to 3,000 in seven years. He lived under tremendous stress as pastor of a large church, and he had just endured a long and taxing fight with the city to purchase property that would allow his church to expand. Ironically, he had never felt more alive. He was invigorated by the challenges. At times he was so inspired, he would go away to a hotel and work day and night, barely sleeping, for four or five days at a time. He would come home with months’ worth of work done in five days. He was riding a wave of enthusiasm and productivity most people could only dream of. But with this soaring mood came something darker he couldn’t name—a sense that he was out of control. He needed grounding, to manage his racing thoughts and emotional flights. So without understanding why, he engaged in bizarre behaviors that seemed to help ground him. He sped at 80 mph along country roads at night, opened the car door, and touched his foot to the pavement passing by underneath. He visited places where people had been murdered. He went to dangerous locations late at night. The effect of these experiences? “I would feel bad. The guilt would bring me down so I could manage,” he said. Sometimes he drove all night and found himself eating breakfast in another city, with no idea of how he’d arrived, no memory of the previous eight hours. One night, driving around the city, he stopped to use the bathroom at a public park with a bad reputation. Here, in an incident he remembers too dimly for true recall, his dream life turned to a nightmare in the form of a citation for indecent exposure. Sitting in his car, with a ticket from a police officer in his hand, he felt something he’d never experienced before: a crushing and desperate depression that made him want to end his life. “I was ready to kill myself. I had a plan,” he said. Local media reported on the story of his citation, and his church and the community were shocked. “For the next three months we basically bled to death,” Hoefs says. No one could understand what had happened. Church leaders privately asked him to resign. Under his therapist’s direction, he told them he would deal with that issue later, and he went to a hospital in Michigan to get help. Chapter 6 of Jon Walker’s book, Breakfast with Bonhoeffer, is called “Jesus Defines”. 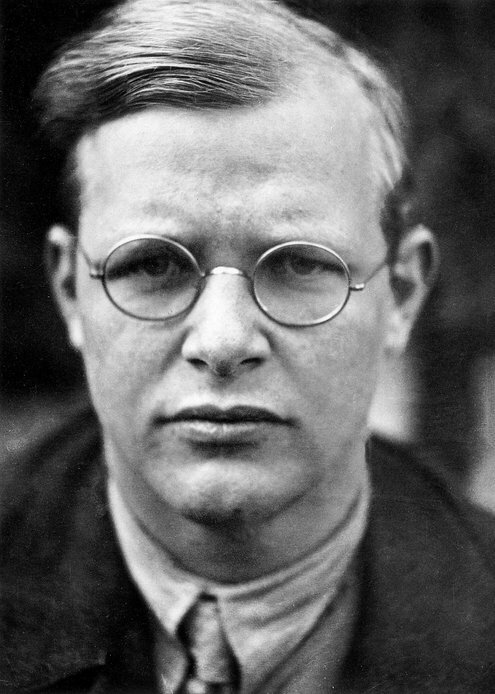 Bonhoeffer teaches “that Jesus must be central to our lives. He is the mediator between God and us, but he also is the mediator between us and others. When we become believers, we can never look at anyone the same. We have to look at them through the lens of Jesus and interact with them according to our relationship with Jesus.” (75). Bonhoeffer said, “Our hearts have room only for one all-embracing devotion, and we can only cleave to one Lord. Every competitor to that devotion must be hated” (75). Jesus…will not tolerate wishy-washy disciples (77). Following Jesus means we must stay in the present and cooperate with him as he works through our circumstance no matter how difficult they seem (79). It’s hard to know how to respond to everything we see in the 24-hour news cycle. News, commentaries, social media, and television report hundreds of injustices (and thousands still go unreported). How do we choose which ones to engage? On top of that, we’re prone to respond to things that we feel relate more to our own lives. So when we receive news that’s far removed from us, we emotionally disconnect. It’s understandable considering how much comes at us constantly. Many of us don’t respond in the grief and outrage that actually fits with the news of infanticide in Third-World countries or Christian persecution in the Middle East. We care, at least in principle, but it’s just not a core concern. The same is true about the most recent tragedy in Ferguson, Missouri. Many of us don’t know how to respond emotionally because we can’t relate to the situations surrounding Michael Brown’s death. Since the news began reporting on Mr. Brown’s death, things have only escalated. A helpful article from the New York Times reported that Michael Brown was killed Saturday in Ferguson, igniting protests and outcries in St. Louis County. The report revealed that Mr. Brown was unarmed when shot. What actually happened is still in question. One side said he and a friend were stopped on the way home from the store because they were walking in the middle of the street. Witnesses say Mr. Brown’s hands were in the air when he was shot several times, while the police say that Mr. Brown was shot during a fight over the officer’s gun. It is hard to understand why an officer would need to shoot a teenager “several times” over a fight with a gun, just as much as it is hard to believe that an officer would unjustly kill a teenager with his hands up. At the end of the day, only those present know what really happened. But given the facts, we all can admit it’s quite possible that a fatal injustice was done to Michael Brown. Despite the lack of details and our ignorance about the situation, what then is the Christian’s responsibility? Is it right to remain apathetic when we hear about tragedies such as these? As a Christian, even if you can’t relate, you have an opportunity. As a black man, I don’t connect with the situation as easily as some might assume. I’m not from the city or suburb. I’ve never had a negative encounter with the police. It’s unlikely I would ever be bold enough to run from the police or resist arrest. It also helps that what many have ignorantly profiled as “suspicious clothing” isn’t a part of my wardrobe these days. Therefore, the chances of me getting gunned down by the police are slim. From what I’ve read, the most obvious thing Mr. Brown and I have in common is that we’re both young black men. But more than that, the young man killed was human — like us all. He was made in God’s image. Regardless of the circumstance surrounding his death, we can care. Every Christian can respond to this situation. If an injustice took place, it matters because, according to the Scriptures, injustices are an abomination to the righteous (Proverbs 29:27). And regardless of what actually happened, we have a responsibility to pray for “all people” (1 Timothy 2:1), without prejudice. So what should our response be? Every Christian can pray. This perverse view Paul meets, and enjoins Christians to include in their prayers all men, and not to limit them to the body of the Church. Therefore, in that same spirit, I encourage every Christian that encounters tragedies and injustices like this to pray. Pray for Ferguson, Missouri. Pray for peace to be restored in this city. Pray for Michael Brown’s family as they mourn the loss of their loved one. Pray that if they don’t know our Lord Jesus, that they would come to know him through this tragedy. And pray that if they do know Jesus, he would give them peace that surpasses all understanding. Robin Williams’ desperately sad ending arouses our sympathy, as it should. But we must not confuse our sympathy with God’s salvation. There’s only one path to eternal life. Robin Williams’ suicide, as is every suicide, is a tragically sad thing. My heart hurts to think what Williams’ inner life must have been like at the end to drive him to such a terrible decision. My heart aches for those he has left behind – his wife, his children, loved ones and friends. His death has left a hole in their lives that nothing and no one can fill. In the wake of his suicide, billboards and media pundits alike have been assuming that Robin Williams is now in heaven, making God laugh along with other funny men who left this earth before their time. So is he? There is one thing we do know and one thing we do not know that can help us think clearly about Robin Williams’ eternal destiny. The one thing we do know is that access to the presence of God and life in the age to come is reserved exclusively for those who have placed their eternal trust in Jesus Christ. Jesus himself said, “I am the way, the truth, and the life. No one comes to the Father except through me” (John 14:6). There is nothing remotely ambiguous about that statement. All roads may lead to Rome, but only one leads to eternal life. The only door that leads to life is the narrow gate that Christ himself has opened. As Peter puts it, “[T]here is salvation in no one else, for there is no other name under heaven given among men by which we must be saved” (Acts 4:12). The world naturally will stiffen their necks when they hear these words and throw epithets at those who verbalize it. But their argument is not with us, it is with Jesus himself. He is the one who said it. We simply agree with him. Now Williams’ desperately sad ending arouses our sympathy, as it should. But we must not confuse our sympathy with God’s salvation. There is one and one path only to eternal life, and that path has not been altered by so much as one centimeter in 2,000 years. That’s what we know. The one thing we do not know is whether Robin Williams did business with God in his dying moments. While his mother was a Christian Scientist (a counterfeit form of religion which is neither Christian nor scientific), his father was an Episcopalian – so it is certainly possible that Williams heard the gospel in his formative years and may have remembered it all his life. The thief on the cross did not place his faith in Christ until he was drawing his final breath. His last words were,“Jesus, remember me when you come into your kingdom.” In response, Jesus’ last words to him were, “Truly, I say to you, today you will be with me in Paradise” (Luke 22:42-43). It takes but one moment, one whispered, even agonized, prayer, to pass from eternal death to eternal life. No one but the thief and Christ knew that this transaction had been made. The thief’s wife and children didn’t know, and it’s unlikely that any of the onlookers heard this private exchange. As far as everyone knew, this man died as he lived, a sinful, unrepentant and broken man. Yet we know better now, and one day we will be where he is, with Jesus in Paradise. Will we see Robin Williams there? We don’t know. Only two men know the answer to that question.